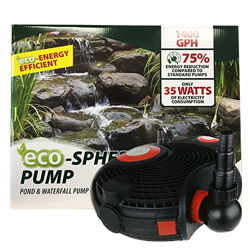 Alpine’s Eco-Sphere are high performance pumps ideal for filtration systems, waterfalls, and ponds. Engineered to be highly energy efficient while maintaining maximum output. Our durable “pre-filter” pump cage minimizes pump damage and clogging by selectively screening larger debris particles. Pumps feature a convenient carrying handle and 360° rotating adapters for easy placement. 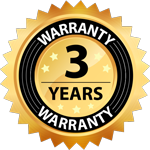 Includes “click fit” connectors to allow simple disassembly for routine maintenance and compatibility with other Alpine series pond systems. Energy Efficient : Over 75% reduction in energy consumption compared to other pumps in the market. Save up to 637 kilowatt per year. See tremendous savings in your electric bill. Ideal for heavy duty general pond, waterfall or filter systems use. Large prefilter, easy to disassemble on both sides. Can pump dust particles of size up to 0.24"